About 2 weeks ago a new Internet Access Provider called Aptics started advertising VoIP telephony and ‘4G’ services in the local newspapers. We have tried the Aptics broadband internet before for our primary connection at the office, but then, the company was still providing services primarily through ISPs ZOL and Yo Africa. The company is now going to market directly in addition to the partnerships. We visited them a few days ago to get the full story on what the company is offering and what you the reader should expect and indeed if you should be excited. Aptics is one of Zimbabwe’s 12 Internet Access Providers (IAPs) that got licensed by the telecoms regulator about 2 years ago. Other new IAPs that got licenses around the same time include Aquiva (we wrote about them last week) Valley Technologies (known mostly as Spiritage or Brodacom), Dandemutande, and an ISP called Pecus that has not been visible at all since they got the license. Now back to Apitcs, the company says they have been working flat out since they got the license procuring infrastructure and rolling out a WiMax network. “Our thrust from beginning was getting the formula right”, says Aptics founder and CEO, Jahdiel Mafukidze. And that formula he explained has been to put more emphasis on the last mile; the company ensured they got the last mile connectivity technologies right. The last mile in telecoms is the means of connection at the customer’s premises i.e. either fibre, WiMax, Wi-Fi, CDMA, 3G and so forth. In addition the company needed a technology that could support VoIP natively and one which, in future, could transition into new technologies like LTE efficiently. The company has been rolling out mobile WiMax in all the major cities in Zimbabwe and so far says the whole of the capital city, Harare, is covered. Bulawayo, the second largest city in the country now has about 70% coverage and chief executive says they are working to roll out more base stations to cover the whole city. Mutare, Gweru, Masvingo and Chitungwiza also have network coverage now though Gweru is only 80% covered. One of the major problems the company has faced rolling out the network has been that they have had to construct 80% of the telecommunication towers themselves as they found it difficult getting tower owners (mainly the incumbent GSM operators) to share the passive infrastructure. While POTRAZ has intervened on some occasions it remains a problem for new incumbents get space to rent on existing towers. Last week, Aptics officially opened its Harare city shop to consumers to offer the new VoIP and WiMax broadband services. The company is opening other shops in all cities and centers. Aptics has to explain to customers though that the VoIP numbers they are selling them will only call other Aptics numbers for now. Calling other networks is only available for the company’s testing purposes. 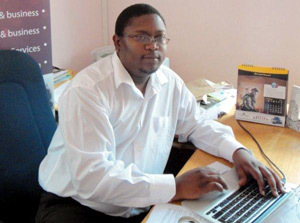 Mafukidze says his company is still finalising interconnection agreements with mobile operators and Zimbabwe’s sole fixed line operator, TelOne. They expect to have live and commercial interconnection with most of the major networks in the coming weeks. International connectivity is also not commercial yet but Mafukidze says it’s live and should be commercial soon. The voice service, the VoIP, Aptics says is mainly targeted at becoming a landline solution for both home and corporate customers. The company comes into a voice market that’s quickly saturating. Voice services in Zimbabwe are now offered by a total of 11 telecoms operators: 3 GSM operators (Econet, Telecel and NetOne), 1 landline operator (TelOne), 3 CDMA providers (PowerTel, Africom and Brodacom) and now, 5 VoIP providers (Gigatel, Telco, Econet, and now, Aptics and Aquiva). The GSM operators and TelOne currently account for nearly all of the voice subscriptions in the country, about 75% of Zimbabwe’s total population. It will not be easy for Aptics to get a significant share of that market, especially as interconnection agreements are not easy to secure. The company says it comes to the market with a promise of high quality connectivity, and high quality customer service, a promise every operator makes when they launch. “One of the things customers have been crying about is quality of service and affordability,” says Mafukidze. But Mafukidze also promises to offer a new value proposition, which current operators have so far largely ignored: affordability; “We are targeting the un-served market, mostly home users. We have products that are specifically tailored for low income earners,” he explained. He clarifies that they are not ignoring the corporate business market but emphasises that 60% of his focus is with home users. Unlike voice, there’s lots of space in the internet market. And, an innovative provider can even push the new category emerging locally of internet and voice packages offered as a single monthly package. “Internet penetration in Zimbabwe is extremely low and there’s room for a serious player to offer what the market needs,” Mafukidze says expectantly. As for the 4G adverts, we regret that Aptics has decided to take that route to market, and we wish POTRAZ would do something about IAPs putting these fancy tags on their products. Our advice remains to ignore the 4G parts of the promise. l had a chance to meet the other 2 executives from Aptics and discuss their vision of the company future, what they have in terms of equipment, mostly for backbone networks, l was more than impressed! Considering their background and experience, if this translate into full service, Aptics will change how service is delivered in Zim. Hopefully they won’t go the way of Spiritage. After launching last year Spiritage has hit some serious viability challenges laying off staff and closing off some divisions. Telecoms is not a walk in the park. I have had the pleasure of watching Aptics grow from an idea to fruition, proud of the guys and their vision! I will give these guys time. I would love to see some company succeed where all others have failed. I have my serious doubts though as I think 12 IAPs in small Zimbabwe is overkill. I do not see all these guys achieving critical mass to last beyond launch, hype, banner ad mania, much like the over-banked financial services. Instead I see the Econet-Liquid-Ecoweb-Zol ensemble as the best fit for deliverable, sustainable, dependable and robust ICT provision in the country if only they can fine tune their modus operandi. Is Gigatel still in the market? I thought they gave up. With so many IAPS I wonder if they understand that they are just the road to somewhere and will need to create a better value proposition than just cheap internet. Content will always be king!